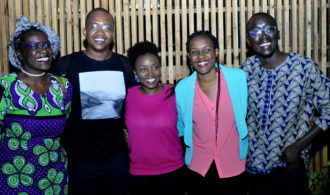 The #KigaliLit session that happens regularly in Kigali, Rwanda this past month featured writers who had been attending the Caine Prize workshop in the East African country. They included previous Caine Prize shortlistees Bongani Kona (2016) and Arinze Ifeakandu (2017). #KigaliLit is an event hosted by Huza Press and other partners in Kigali, Rwanda featuring readings with writers as well as a mix of performances from other artistic genres. In the past, #KigaliLit has hosted the Huza Press Short Story Contest 2016 shortlisted writers Denyse Umuhuza and Landry Subira as well as German writer Sarah Stricker at the Goethe-Institut Kigali. The newest edition of the #KigaliLit was hosted at Kigali’s Innovation Village in Kacyiru on March 31, 2018 with very special guests. The readings were conducted by former Caine Prize shortlistees Bongani Kona and Arinze Ifeakandu as well as Paula Akugizibwe. The three were part of a team from the Caine Prize workshop that was being hosted in the country for the first time. The Caine Prize workshop is a unique yearly event where the Caine Prize conducts training for those who have been shortlisted for the famous prize as well as upcoming writers. The workshop has been hosted all over the continent from Tanzania (2017), Zambia (2016), Ghana (2015), Nigeria (2014), Zimbabwe (2014), Uganda (2013), and other countries. This year the event would be hosted in Rwanda and co-ordinated by Vimbai Shire, Damon Galgut and Elisie Dillsworth, a UK/ Sierra Leone literary agent. The evening in Kigali included the aforementioned Bongani Kona, Arinze Ifeakandu, Paula Akugizibwe, Eloghosa Osunde, Awuor Onyango, Troy Onyango, Dilma Dila, Lucky Grace Isingizwe, and Nsah Mala. The stars of the evening were Arinze and Bongani who read from their shortlisted stories in the Caine Prize past anthologies. Local favourite Paula read from the story she worked on at the workshop. Here are images from the evening hosted by Donalee Donaldson courtesy of the event organisers.